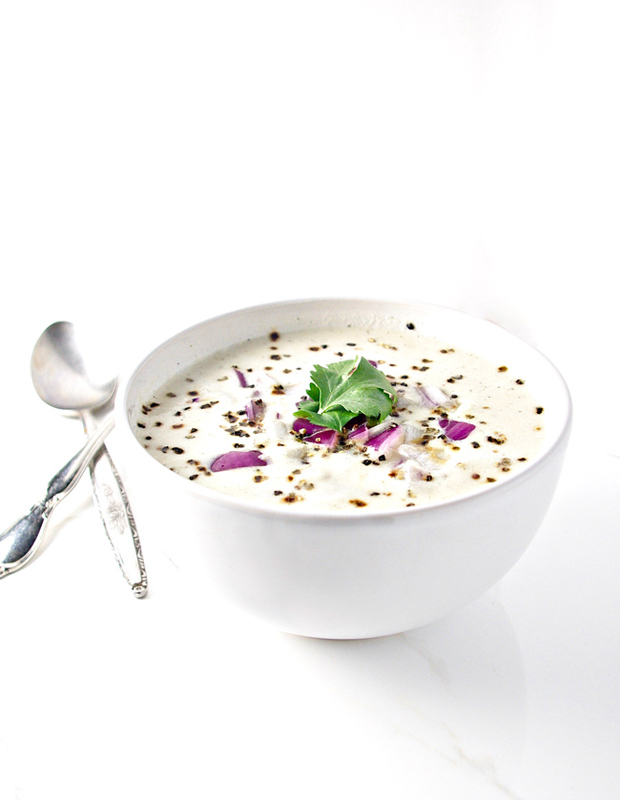 If you are ready to start eating healthier again, or maybe for the first time, but don’t want to sacrifice robust flavor and feeling comfortably full, then Dairy-Free Creamy Garlic and Onion Soup is all for you! In complete and total transparency, I knew I needed an exact opposite of the sweets and treats I enjoyed for, oh, I don’t know, maybe five or six weeks. But I categorically refused to give up flavor. No, I will not detox with bland foods. And you don’t have to either. If there is one thing this recipe is not, it’s bland. Nope. Roasted garlic, sautéed onions, and a blend of herbs and seasonings see to that. Rest assured, your tastebuds will awaken. That’s actually a completely true statement. K-Hubs is convinced he breathes better after a few spoonfuls. Hey, whatever works. 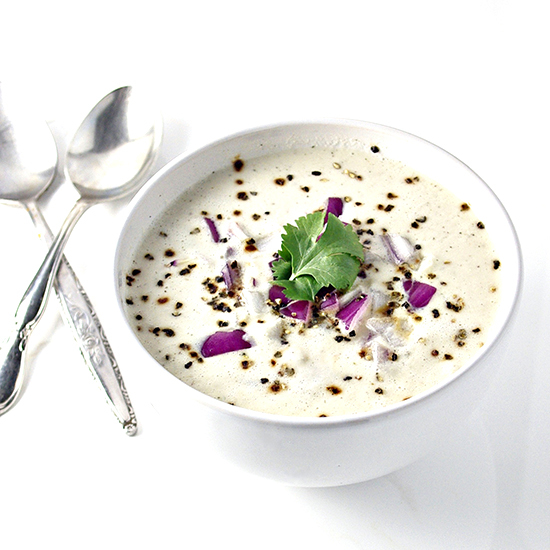 Another benefit to this delectably creamy soup? Not only is it flavorful and filling, it also makes enough for leftovers. Seriously. Who wants to stand at an open fridge, waiting for new foods that aren’t actually there to jump out and say, “EAT ME!” I honestly look in the fridge, stare, think something new will pop out at me, and then finally admit we are either out of food and I need to make a trip to the store OR we’re just out of the really good stuff. This soup is both here and full of the good stuff. Dairy-Free Creamy Garlic and Onion Soup is actually a continuation of this delicious soup from last year. However, coconut milk is just not my favorite. So I played around with the original recipe and added cashew cream instead. Cashew cream still keeps this soup completely paleo and vegan but without sacrificing one’s tastebuds. 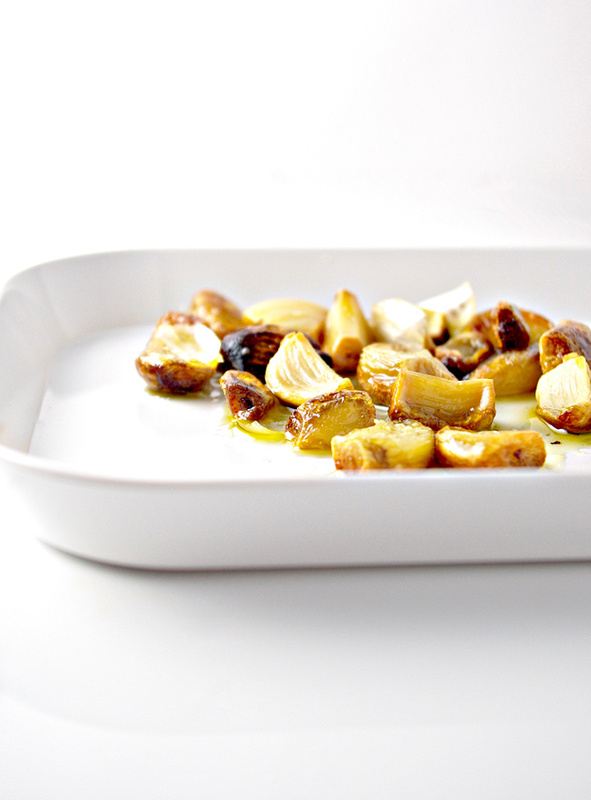 Like the earlier recipe, you’ll roast your garlic in the oven for about 45 minutes. Then you’ll sauté your chopped onions, adding the roasted garlic to the skillet for good measure. Throw them in a high-spend blender, add the remaining ingredients, blend until smooth (about five minutes), and call dinnertime. This is our go-to soup when we want a comfort food that isn’t heavy, we feel colds coming on, or we just need something that contains vegetables but doesn’t taste like vegetables. Combine 2 tablespoons olive oil, 1/8 teaspoon sea salt, and garlic cloves in a small cake or bread pan and roast covered for 45 minutes. In a sauté pan, combine roasted garlic, chopped onions, and remaining 2 tablespoons olive oil and sauté until onions become translucent. Pour mixture from pan into a high-speed blender and add cashew cream, bone broth, remaining 1/8 teaspoon sea salt, pepper, thyme, and optional seasonings. Blend until smooth, about 5 minutes. Reheat in saucepan, if desired, or serve warm as is. Store remaining soup in glass jars for about 3-4 days or freeze for longer storage.